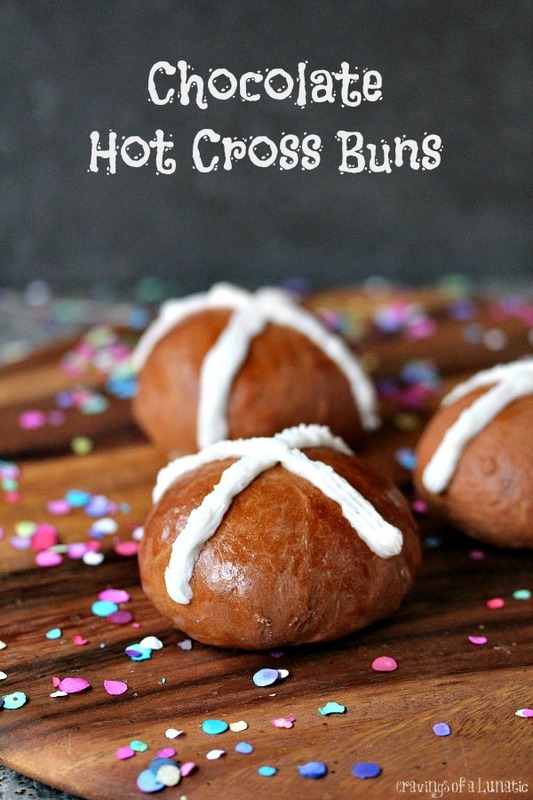 These Chocolate Hot Cross Buns are so simple to make. These are my daughter’s personal favourite. She requests them as often as possible. These chocolate hot cross buns are my daughter’s favourite recipe of all time. She is a total spaz when it comes to these buns. She asks me to make them often. Occasionally I oblige. Not often, because they are so good I feel like it’s not fair to all the other hot cross bun recipes out there. They were a happy accident the first time I made them. I planned on making hot cross buns with chocolate chips in them instead of raisins. My daughter is not a huge raisin fan. So I thought I would try something a little different. I hit my mark when it came it different. These blow regular hot cross buns out of the water. They are insanely good. Once you start eating them you won’t want to stop. So make a ton right out of the gate. I was super busy the first time I made these. When the buzzer went off on the bread machine I just tossed in the chocolate chips. I did not compute the time or do the math in order to realize it was the first buzzer going off. I thought it was the buzzer I set to add the chocolate chips at the end of the cycle so they would stay chocolate chip-like. More like chocolate chip cookies. However I made a huge error on time, and added them entirely too early. I thought I had ruined them but it turns out my young hooligan loved them. 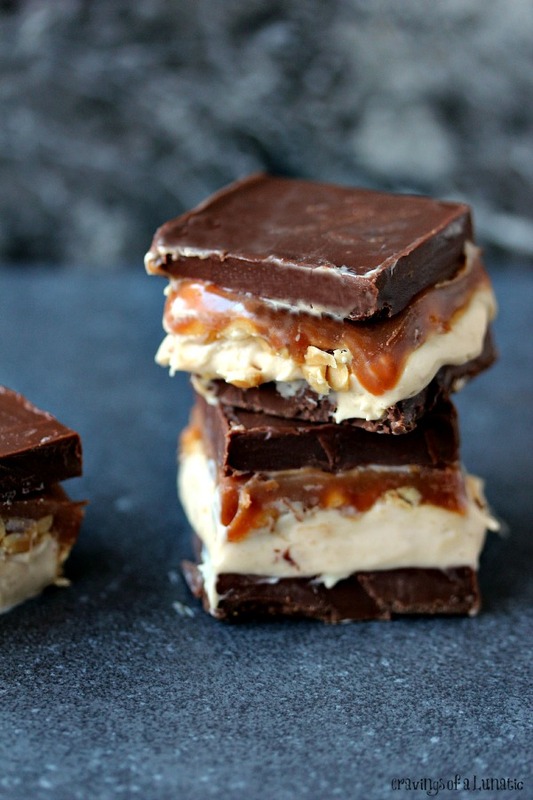 She tried them out and quickly declared them her favourite recipe of all time. She’s been obsessed with them ever since. That was years ago. Maybe 4 or 5 years, at least. You have to try these out for yourself. My daughter is a super picky eater so if she deems something the best in the world it’s a pretty safe bet they are incredible. Try these today. You will not be sorry. They will rock your world! Cover two cookie sheets with parchment paper. Set aside. Place all of the ingredients for the buns in your bread machine mixing bowl in order listed. Turn the machine on the dough setting. Turn the machine on and allow it to do its thing. When the bread machine is done, remove the dough and set on lightly floured surface. Divide the dough into about 18 pieces. Shape into round, slightly flat buns. Place on parchment lined cookie sheets. Cover and allow to rise for 30 minutes, so they double in size. Combine 1 egg and 1 tablespoon of water in a small bowl, whisk until combined. Brush this on the buns, lightly. 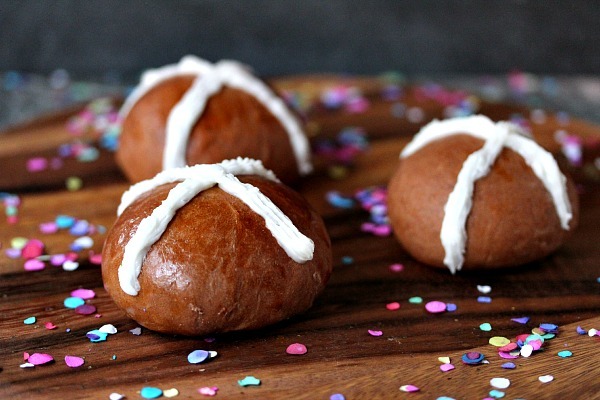 Make cuts into buns to make little crosses. Place the cookie sheets in the oven, bake at 350 degrees F for 15 to 18 minutes. Remove from oven when they appear golden. Combine ingredients in a small bowl, whisk until combined. You can add more confectioners sugar if it needs to be thicker, or you can add more milk if it needs to be less thick. If you prefer to serve them at room temperature you can allow them to cool completely on wire cooling rack. Then make thick icing instead of a glaze, all you do is increase the amount of confectioners' sugar to get a thicker consistency. 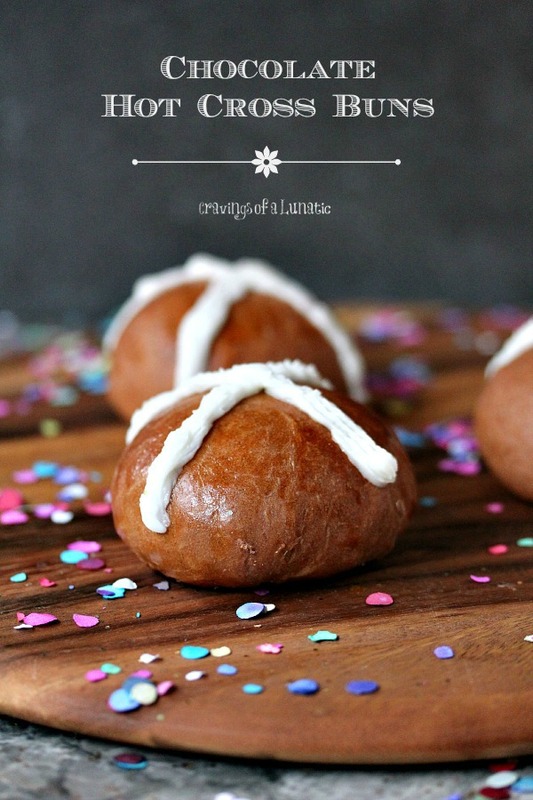 Put in a piping bag and pipe little crosses on each bun. 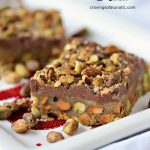 Serve with a big old chocolate loving smile! We love these buns. They make a regular appearance in our kitchen. Another thing that makes a regular appearance in our kitchen is Blundstone Boots. We have been wearing them at the barn for riding for years. We are so loyal to this company. They are the only riding boots me and my daughter wear. What we’ve learned about Blunnies is they are not only good for riding, but for wearing every day, for every thing. My daughter wears them to school, to nerf night, to humans vs zombies, to paintball, to the grocery store, to the mall, and everywhere in between. We also love wearing them in the kitchen. These boots are more comfortable than running shoes. They make perfect cook or chef shoes. If you have never tried them I highly suggest you invest in a pair. You will love them. Can you spot the new pair? I took the photos outdoors so you could get a better look at them. My kitchen has horrible lighting so I cannot get good photos in there. I take all my food shots in my another room in the house. Blundstone Boots Canada sent me a pair for free to review. Thanks so much for the Blunnies. We can never have enough of them. Both of us had not purchased a new pair in about 10 years. That’s how long these boots last. You rarely have to replace them. They take a lot of abuse. Wondering where to find a store near you? You can check out their store locator to help you find one near you! Be sure to check out their Instagram Photo Contest as well, you could win a free pair! So follow them on Instagram to stay up to date on what the company is up to. Be sure to swing by the Blundstone website to check out all their awesome boots. I can highly recommend them for in the kitchen, and out of it. We’ve been wearing their products for about 15 years or more. They are the best quality boots you can buy. Now go make some Chocolate Hot Cross Buns. While you munch them spend some time cruising the blunnies website. Disclosure mumbo jumbo: Blundstone sent me 1 pair of boots to review. I was not compensated for this post. All opinions are my own, and 100% blunt, because that’s how I roll. Post may contain affiliate links. Thanks for supporting Cravings of a Lunatic. I’ve never made chocolate hot cross buns but they’re on my must-make list now. I saw one of the actors wearing them on Supernatural. I had a good giggle over it. We love them. Most comfortable footwear in the world. K wears hers everywhere. Even to school. They are great in the kitchen, no back aches after. You have to try them. K is addicted to them. 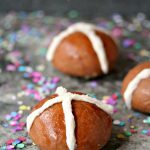 I love hot cross buns, and made my own last year which were a huge hit too. We (read: me) dislike raisins too, so I substituted with sultanas, which are kinda like raisins but are plump and sweet instead, they were amazing. But chocolate hot cross buns sound amazing too, and I love a happy accident like this. 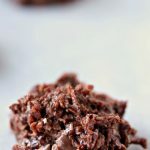 I’ve been dabbling with the idea on doing chocolate chips in my next batch too, but don’t think I could re-create your happy accident without a bread machine. Hey Lisa. I freaking love sultanas. My dad actually used to buy huge bags of them every week and we’d nosh on them to our hearts content. They are so much better than regular old raisins. I’ll have to zip over and check those out. I have another one posting where I stuff these ones. I’m sort of nuts like that. 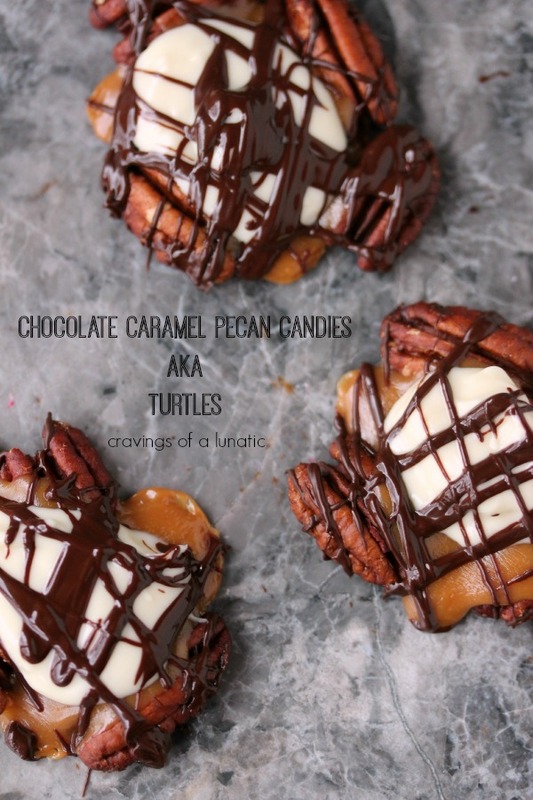 Just melt the chocolate and add it to the dough. Would work perfect. 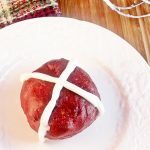 Can you believe I’ve never eaten a hot cross bun let alone make one? I don’t have any good reason for not having done so, it’s just never been something that’s crossed my path while my mouth was open. If your daughter loves them that much, I’ll definitely have to give the recipe a go for my kiddo. They’re gorgeous. Wowzer what a nice change of pace for hot cross buns. You did good, Girl. Sweet! I love happy cooking accidents and those buns sure look like pure happiness in a roll. I need to look into those boots….I have horrible feet issues and in Florida, every house is built straight on slabs of concrete. First of all, chocolate hot cross buns? Why has no one done this before? Sometimes accidents are such a happy thing. In this case very happy. Secondly, I need to check out those boots! I love comfy boots that are good for everything and everywhere so they sound right up my alley. Thanks for telling us about them! I have never even thought of adding chocolate chips to Hot Cross Buns. What have I missed? Easter is chocolate, right? These look and sound wonderful, Kim. Must try them – they’d be a hit with the family. Lovely shiny boots, darling! I love hot cross buns, but don’t eat them often now that I gave up bread. 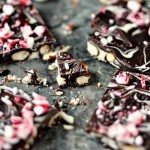 However, these chocolate ones look and sound amazing. What a nice accident. One of these days I am going to try them. Pinning for later.